Thinking of buying a new memory card for your camera, mobile, computer, GPS device, MP3 player, or any other device? All memory cards look the same more or less. But a closer look will reveal that each card is cut out for a special purpose ... not to forget, for a different capacity. SD cards are typically the most common type of memory cards available in the market today that go up to 2GB in terms of how much they can support. If you're looking for cards with a higher capacity, I suggest you go for Secure Digital High Capacity (SDHC) memory cards that can hold a maximum capacity of 32GB. Some folks I know of demand fast processing speeds along with higher capacities. Secure Digital Extended Capacity (SDXC) memory cards will probably be a safe bet for them, as they support a maximum capacity of up to 2TB. For smartphone users, Micro SD memory cards are quite a rage since they are the most popular method to store files. You can save large files ranging from 4GB to 32GB in these cards that are now finding alternate use in MP3 players and GPS systems. eXtreme Digital (xD) memory cards still continue to be used in some cameras from Olympus and Fuji. Ditto for Memory Stick Duo memory cards that are used in Sony digital cameras since launch. Ultra Direct Memory Access (UDMA) CompactFlash (CF) cards are supposedly the quickest around for most cameras. So there, with so many choices available, which memory card should one go for? 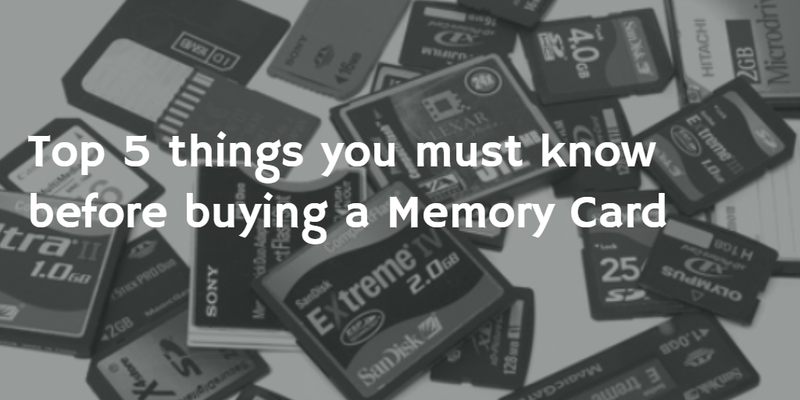 Here's a list of Top 5 things you must know before buying a memory card. The quality of an image has nothing to do with your choice of a memory card. It doesn't improve if you buy an expensive memory card. Your device might not always be able to catch up with new and changing technologies. For instance, if you buy a Secure Digital Extended Capacity (SDXC) Memory Card, it might be incompatible with your camera. You might encounter a similar roadblock while using the SDXC card with your computer, so check beforehand. Check in advance about how many files (images, videos, etc.) you can store on a specific memory card. The size of each file differs. Also, the file types might be different. If you're learning photography, using a 1GB memory card for your camera is usually sufficient and doesn't break your bank either. As your skills improve, you could upgrade to 4GB, 8GB, 16GB, and above. Cheaper memory cards are slower and less reliable. If you're concerned about data recovery in case the memory card breaks down at some point in time, you might want to go for the new generation of memory cards from SanDisk, Samsung, or Lexar. Finally, whatever memory card you decide to go for in the end, ensure that it meets the storage and speed needs of your device.